KR Natural Products have been producing natural products since 1979 and natural products for animals since 1990. We are well experienced in natural products and how they are best combined to produce the fastest and safest results. All of our products are produced in GMP rated facilities to the pharmaceutical standards. What Is The KR Natural Products Difference? Quality of Ingredients. For natural products, nothing is as important as the quality of the ingredients, the difference the quality is in the freshness, processing methods and the level of the actives in the ingredients. These will define how effective and safe a natural product is. There are many grades of ingredients that are available for natural product manufacturers to choose from. We use only the best that is available. Formulations. The nutrients must combine in a way that complements each other and in amounts that produce the best results without over dosing. We have been in the natural products since 1978 having produced the first animal product in 1990. With our experience in working with natural products we offer some of the most effective and safe products for animals in our field. For example, our wonderful products are formulated with pure nutraceuticals, no binders or fillers to prevent the ingredients from being absorbed. Customer Dedication. Our dedication to bring to our customers the best and the latest in health enhancing natural products for animals. We stand behind all of our products with a money back guarantee. Cold pressed oils. Commercial oils are processed so in a way that increases the temperature which in turn destroys most of the beneficial nutrients. Because we use cold processed oils MaxiDerm is able to retain most of the omega fatty acids. Full spectrum of fatty acids. KR Natural Pets uses flaxseed, fish and sunflower oils in MaxiDerm to give a full spectrum of fatty acids such as omega 3, 6, 9 and other essential fatty acids. Other essential nutrients. MaxiDerm contains B vitamins, natural vitamin E and minerals essential for healthy coat. please scroll down to see MaxiDerm EFA's ingredients and their benefits. Sulfur is one of the most important minerals for maintaining good health, it is essential for healthy hair, skin and cartilage. Sulfur works with B-complex vitamins for basic body metabolism and is a part of tissue building amino acids. An aid in fighting off bacterial infections, the body assimilates sulfur and forms sulfur containing compounds responsible for many biological activities including fighting infections. With SulfaDerm you can be assured of optimal coat health for your canine. Does KR Natural Products Have Other Great Products? Yes! KR Natural Products has an entire line of Pet products to help your dog reach optimal healthâ€¦naturally! KR Natural Products have been producing natural products since 1979 and natural products for animals since 1990. We are well experienced in natural products and how they are best combined to produce the fastest and safest results. All of our products are produced in GMP rated facilities to the pharmaceutical standards. Order KR Naturals Skin And Coat Products Today! 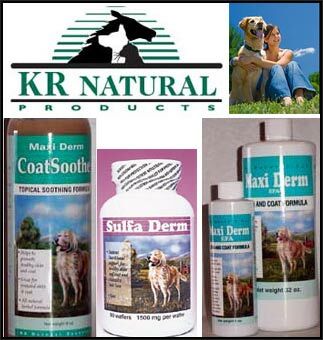 KR Naturals has the product for you no matter what your canines skin and coat situation may be. Whether you just need to maintain a healthy coat, or need to deal with problem shedding, we have the products for you. So what are you waiting for? Visit our retailers or call our friendly staff today!